Sinus (left) and chest (right) computed tomography scan of a 59-year-old male ex-smoker with chronic sinusitis and intermittent hemoptysis of 2 months' duration. This patient had a history of fleeting arthralgia, and he had an elevated erythrocyte sedimentation rate (83 [normal 1–13] mm/hr). A computed tomography scan of the paranasal sinuses (Figure 1) showed patchy destructive changes in the nasal septum. Erosive changes were present in the nasal turbinates and the adjoining medial walls of the maxillary sinuses. Irregular mucosal thickening of the nasal passages and maxillary antra were also observed. A computed tomography scan of the patient's chest (Figure 2) showed multiple, bilateral irregular alveolar infiltrates, interspersed with diffuse hazy ground-glass shadowing. 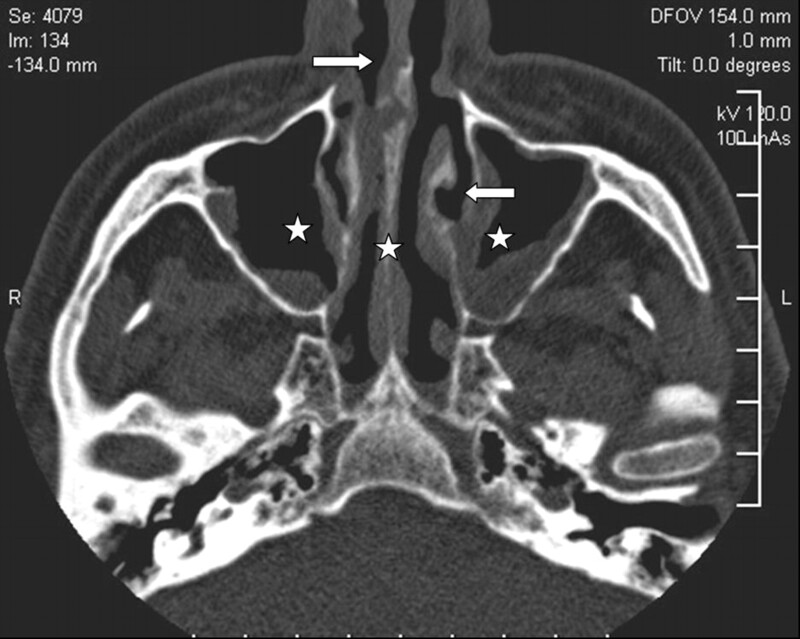 Figure 1: Computed tomography of the paranasal sinuses showing patchy bone destruction of the nasal septum, inferior nasal turbinates and the medial walls of the maxillary sinuses (arrows). Also note the irregular mucosal thickening of the nasal passages and the maxillary antra (asterisks). Figure 2: Contrast-enhanced multi-detector computed tomography of the patient's chest showing bilateral irregular alveolar infiltrates (black arrows) with surrounding ground-glass shadowing. Bilateral small pleural effusions are also evident (white arrows). Wegener's granulomatosis is characterized by granulomatous vasculitis of the upper and lower respiratory tracts and glomerulonephritis. In addition to this classic triad, vasculitis or granuloma, or both, can affect virtually any organ. Upper airway disease is present in 95% of patients with Wegener's granulomatosis. These patients often present with sinusitis, nasal disease, otitis media and hearing loss. Destruction of the nasal septum may result in saddle nose. 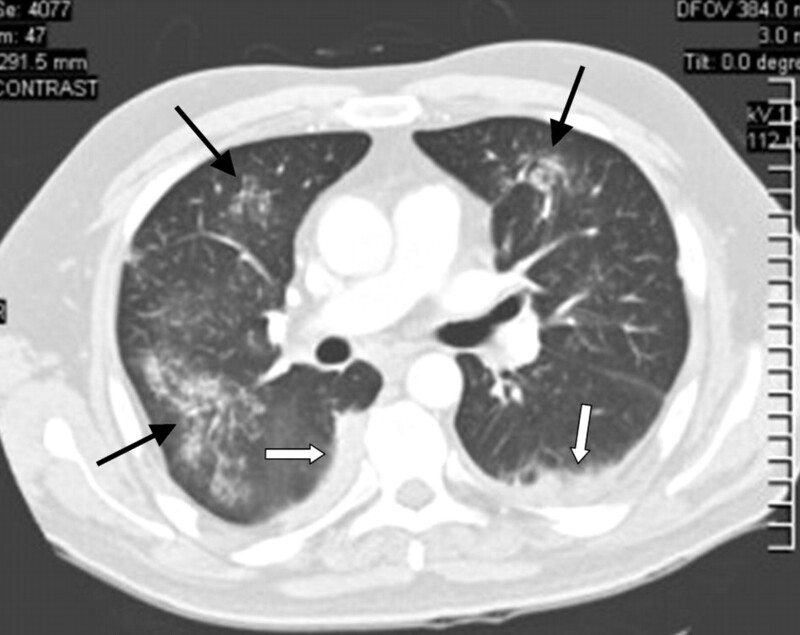 Patients with pulmonary involvement (85%–90% of cases) may have asymptomatic infiltrates or they may present with a cough, hemoptysis, dyspnea and chest discomfort. Renal disease develops in 77% of patients and may manifest initially as mild glomerulitis. Unless appropriate treatment is initiated, rapidly progressive renal failure follows. In patients with suspected clinical features, Wegener's granulomatosis can be diagnosed if the results of a tissue biopsy show necrotizing granulomatous vasculitis. Between 85% and 95% of patients with active systemic disease have circulating anti-neutrophil cytoplasmic antibodies (c-ANCA, antiproteinase-3 ANCA) in their blood. Circulating anti-neutrophil cytoplasmic antibody is less frequently present in organ-limited disease and is even less commonly present in patients in remissions.1 Poor prognostic outcome is correlated with advanced age, more severe renal impairment, alveolar hemorrhage and the presence of circulating anti-neutrophil cytoplasmic antibodies. Of patients who receive a combined regime of cyclophosphamide and corticosteroids, 95% show marked improvements and 75% achieve complete remission. Brown KK. Pulmonary vasculitis. Proc Am Thorac Soc 2006;3:48-57.